Michele Trainiti worked in and around Ethiopia's Hiloweyn camp for nearly eight months, first as project coordinator and later as emergency coordinator. In this piece he describes his experience. 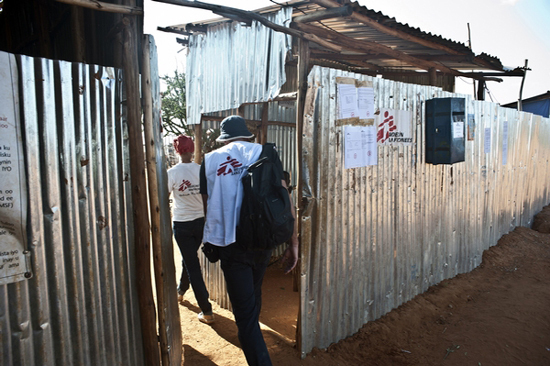 Staff members enter the MSF health center at Hiloweyn camp. I have spent almost eight months in and around Hiloweyn working for MSF. At the onset of the crisis, I was responsible for the health center and later for all of the projects in Liben. When I think of the Hiloweyn refugee camp, I think of Ambia. One of our first patients, nine years old, weighing just 10 kilograms [about 22 pounds], sick with tuberculosis and with no family except her uncle—all the rest had died from starvation or war. Ambia was one of the symbols of our health center. At that time, from late summer to autumn 2011, the MSF health center was packed with patients. We constantly had between 40 and 50 severely malnourished children hospitalized, at least 8 of whom in the intensive care unit. The medics were on exhausting rounds to cover all of the patients every day. Outside of the health center, an endless crowd waited to be admitted to our nutritional program. Hundreds of women with malnourished children. Inside the center, the doctors and nurses were running from one tent to the other, from one patient to the other, for the whole day, with just a few minutes for lunch and dinner. At that time the camp was hosting around 25,000 refugees from southern Somalia who had arrived a few weeks before, and every morning we were distributing burial clothes for those who had died in the camp overnight. We were losing three or four children every week, and at the peak of the crisis we lost almost one per day. The situation was very difficult. The population in the camp would not recognize malnutrition as a disease, probably because they were used to years and years of hunger and drought. Therefore, they would bring us their children only when they were sick with something else (diarrhea, respiratory infections, et cetera). Often the children arriving at the health center were already in critical condition. And among them was Ambia. Eyes wide open on a new world, nine years old with wrists like those of a four-year-old, very defensive, very stubborn, very weak. Always sick. It did not matter how busy the medics were, they would always find a few extra minutes for her. She smiled but she didn't get better. She would gain weight for a few days and then rapidly lose it again. Her weight diagram was a hopeless descending line. Thinking of that time, I now feel that she was representative of the whole situation: a very difficult place where, despite our immense efforts, the situation was not improving. A place where every morning you would count the beds that had emptied overnight, where the mothers wanted to give up and take their dying babies home, since they had lost all hope. A place where the medical staff was slowly but surely wearing themselves out in the exhausting effort of confronting an overwhelming malnutrition crisis. Then one day Ambia improved. We had just changed her diet, since she was not responding anymore to the therapeutic food, and the tuberculosis treatment started producing the first positive effects. I will always remember her uncle quietly crying, thanking the doctors for saving his niece’s life. In October 2011 the situation started to improve. Fewer patients needed admission, fewer patients were dying, and the mortality in the camp was under control. The health and nutrition situation in the camp was slowly stabilizing, the food distribution was reaching more and more people, and the medical efforts were finally producing results. Last week I saw Ambia again, after seven months, and I didn't recognize her. In her traditional Somali clothes, with her hair covered and a veil covering her full cheeks, it wasn't until I saw the stubbornness in her eyes that I recognized my old friend. She was smiling as she shared a packet of biscuits with a friend in the health center. The nurse in the ward told me that she had successfully completed the tuberculosis treatment but she still came every day, out of habit and for the biscuits. Ambia looked at me and her smile seemed to grow. I'd like to think that she recognized me. Now the ward where Ambia was hospitalized is nearly empty. Just a few beds are occupied by sick children. The seemingly endless crowd that queued outside the center has disappeared, and it is very quiet compared to a few months ago. The health situation in Hiloweyn has significantly improved. The nutritional crisis in the camp has been overcome.